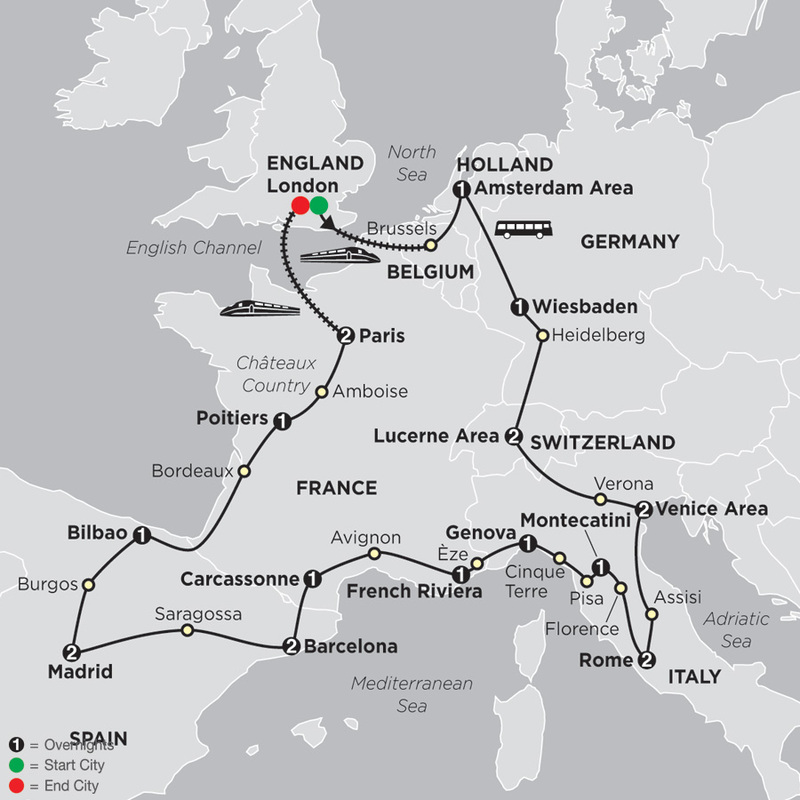 This extensive European tour stretches through Central Europe from London to Rome, then along the Mediterranean to Spain and France. You’ll travel to some of Europe's most famous cities—Amsterdam, Lucerne, Venice, Rome, Florence, Barcelona, Madrid, and Paris—and see some of its most famous landmarks. You'll also stay in some of the smaller—but equally fantastic—cities, including Nice, Carcassonne, and Poitiers in France; the Rhineland in Germany; and Bilbao in Spain. This European tour is filled with historic sights. Italy is a country rich in natural and artistic treasures—so much so that Italy has the highest number of UNESCO World Heritage Sites, some of which you’ll visit on this European tour: Assisi’s Basilica of St Francis and the historic city centers of Rome, Florence, Verona, Pisa’s Piazza del Duomo, and Venice and its lagoon. See the ancient battlements in the beautifully preserved, medieval town of Carcassonne. Admire the royal castle in Amboise and Burgos’ beautiful gothic cathedral, a UNESCO World Heritage Site begun in the 13th century. In Barcelona, see Gaudi’s architectural masterpieces—Casa Mila, Casa Batlló, and the Sagrada Familia—which are also UNESCO World Heritage Sites. This tour through Europe also features stunning scenery. On your travels from Germany into Switzerland, admire awe-inspiring alpine scenery. Spend time in the gorgeous French Riviera and enjoy a scenic journey along France’s Loire, with its rivers, rolling hills, and many castles. Drive through the scenic Rhineland and witness its picturesque countryside, historic castles, and charming villages. Marvel at the rolling hills, terraced vineyards, olive groves, and rural villages as you travel through Tuscany. Plus, enjoy some of France’s loveliest scenery—right out of a Van Gogh painting—in the Provence region. LONDON, ENGLAND–AMSTERDAM AREA, HOLLAND. Transfer to the railway station and board the EUROSTAR TRAIN to Brussels with your Tour Director. From here, travel on your luxury coach to the Amsterdam area. AMSTERDAM AREA–WIESBADEN, GERMANY. Today, enjoy a CANAL CRUISE to see the city from water level, then watch the cutting and polishing of precious stones at a DIAMOND CENTER in Amsterdam. Later, sightseeing with a Local Guide points out the city highlights. In the afternoon, travel southward to Wiesbaden. WIESBADEN–HEIDELBERG–LUCERNE AREA, SWITZERLAND. Drive through the scenic Rhineland and enjoy splendid scenery as you skirt the Rhine river. Continue into Germany’s oldest university town, Heidelberg, nicely located at the confluence of the Neckar and Rhine Rivers, for a short visit. Carry on to Switzerland for two overnights in the Lucerne area. LUCERNE. Lucerne is nestled amid its snowcapped Alps, surrounded by its lake, and graced by the clear mountain waters of the Reuss River. Your visit takes in the impressive city walls, CHAPEL BRIDGE, ornate patrician houses lining cobblestone streets, and the LION MONUMENT—a masterful stone sculpture in honor of the heroic Swiss Guard of Louis XVI. A grand selection of optional activities completes the day: a cruise on the fjord-like lake or a cable-car ride to the 10,000-foot summit of Mount Titlis. LUCERNE AREA–VERONA, ITALY–VENICE AREA. More wonderful alpine scenery as you drive into the mountain ranges that surround massive St. Gotthard Pass into the warmer and sunnier ambiance of Canton Ticino, then cross into Italy and drive across the Po Valley to Verona, medieval setting of Shakespeare’s Romeo and Juliet. See Juliet’s house and balcony, and stroll around the picturesque market square. Tonight, arrive in the Venice area. VENICE. Venice is more like a marvelous film set than a real-life city, with its criss-crossing canals, gondolas and water buses, arched bridges, and palaces. Your included orientation starts with a BOAT RIDE to St. Mark’s Square and is followed by some time at leisure and a chance to visit a GLASSBLOWING WORKSHOP. Don’t miss out on the optional gondola trip. VENICE AREA–ASSISI–ROME. An interesting drive southward through the gentle Umbrian hills to Assisi, where St. Francis was born in 1182. Visit the world-famous BASILICA with its beautiful frescoes by Giotto, then head for Rome. ROME. The “Eternal City” is steeped in history, vibrantly alive, exciting, and absolutely unique! Included sightseeing with a Local Guide starts with St. Peter’s Square and Basilica. Other highlights are the iconic Colosseum, the largest amphitheater ever built and Circus Maximus. An optional visit is available to the Vatican Museums and Sistine Chapel, world famous for Michelangelo’s The Last Judgment. ROME–FLORENCE–MONTECATINI. Journey to beautiful Tuscany. Stop in Florence, Renaissance gem and city of the Medicis, admire the city’s timeless beauty on the included walking tour with a Local Guide that features most of the city highlights. Then on to Montecatini. MONTECATINI–PISA–CINQUE TERRE–GENOVA. Take a break in Pisa where you hop on a mini train to see the SQUARE OF MIRACLES and the amazing Leaning Tower. Then, hop aboard a TRAIN to discover some of the five spectacular Cinque Terre villages. Here, the beauty of the rugged cliffs and romantic fishing villages once inspired poet Lord Byron. From Levanto, head towards Genoa, birthplace of explorer Christopher Columbus. GENOVA–ITALIAN RIVIERA–ÈZE, FRANCE–FRENCH RIVIERA. Today’s included guided tour is an excellent introduction to Genova. A maze of squares and alleys, the city grew around the port, a natural inlet, and boasts the largest medieval historical center in Europe. Journey northwest, with views of the Italian Riviera. Continue to France for a visit to a PERFUME WORKSHOP in Èze before traveling along the celebrated Côte d’Azur. An optional Monte Carlo by Night excursion with dinner is available. FRENCH RIVIERA–AVIGNON–CARCASSONNE. Today’s journey will take you through some of France’s loveliest scenery, sun-drenched landscapes right out of Van Gogh’s paintings, on the way through Provence. Stop for a visit in historic Avignon. Continue westwards to Carcassonne. CARCASSONNE–BARCELONA, SPAIN. Enjoy a visit of this almost-untouched piece of medieval fortified architecture, still standing in all its walled glory with drawbridges, towers, battlements, watch turrets, ramparts, and even arrow-slits to repel the enemy. Later, cross the border into Spain and arrive in Barcelona. BARCELONA. This morning’s sightseeing with a Local Guide includes a drive around Montjuïc to see the Olympic Stadium and a panoramic view of the port and city. The drive continues to the city center to Plaza Catalunya and Paseo de Gracia to admire the greatness and eccentricity of Gaudi’s architectural masterpieces in the Houses Batlló and Mila and the Sagrada Familia (entrance fees not included). BARCELONA–SARAGOSSA–MADRID. See more of Catalonia as you drive northwest, stopping in Saragossa through the very heart of New Castile for two overnights in Spain’s capital, Madrid. MADRID. Not only because it’s the capital of Spain, but also because it is situated 2,180 feet above sea level, the Spaniards say Madrid is the nearest thing to Heaven. Enjoy the main highlights on the included sightseeing excursion. The optional trip to Toledo is rewarding, too. The splendid setting is like a great open-air museum of Spanish history and art. MADRID–BURGOS–BILBAO. Stop in Burgos to visit the beautiful gothic cathedral. On through Basque Country to Bilbao, now famous for four contemporary architects: Norman Foster, Santiago Calatrava, Cesar Pelli, and Frank Gehry. BILBAO–BORDEAUX, FRANCE–POITIERS. A change of scenery as you travel into France across Gascony for an orientation of Bordeaux, the wine capital of France. On through the Cognac area to Poitiers, of Black Prince fame. POITIERS–CHÂTEAUX COUNTRY–AMBOISE–PARIS. Leave the “Town of a Hundred Bell Towers” for a scenic journey along the Loire. Stop in Amboise before reaching Paris in time to enjoy an optional excursion. PARIS. One full day to explore the city that’s known throughout the world for its fashions, art and museums, delicious food, and joie de vivre. Included sightseeing with a local expert shows off many of the best-known Parisian sights. Optional excursions are also available to the Palace and Gardens of Versailles. "I enjoy sharing my stories about each country and city, and seeing travelers' reactions as they savor new cultures and experiences every day. Few other things in life make such a major impact in such a short time. It's so wonderful to meet a group of people who start the vacation as strangers but then often come away as lifetime friends. This gives me the passion to do what I do!"